I used to go shopping a lot. It was actually one of the many ways that I used to disconnect or numb my feelings. This was at a period when I was living in Chicago and, at the time, I was living with my ex in his condo. I was working and I really didn’t have to pay much in rent so I spent all my money on either food — and at the time was bulimic so it was money wasted — or drugs — which was also kind of money wasted — and alcohol. So the bulimia and substances were certainly one mechanism to disconnect or dissociate; but I found that shopping was the other way that I could spend my time doing something that would distract me. Also at that time in my life I lived such a double life because so much of my world — bulimia and substance addiction — is very, very secretive you know, you live such a secret life. And shopping was another way that I could just be with myself and be alone ... and that just kind of became the normal way of being. And while the amount I was shopping was certainly an escape mechanism, I've also always loved fashion. 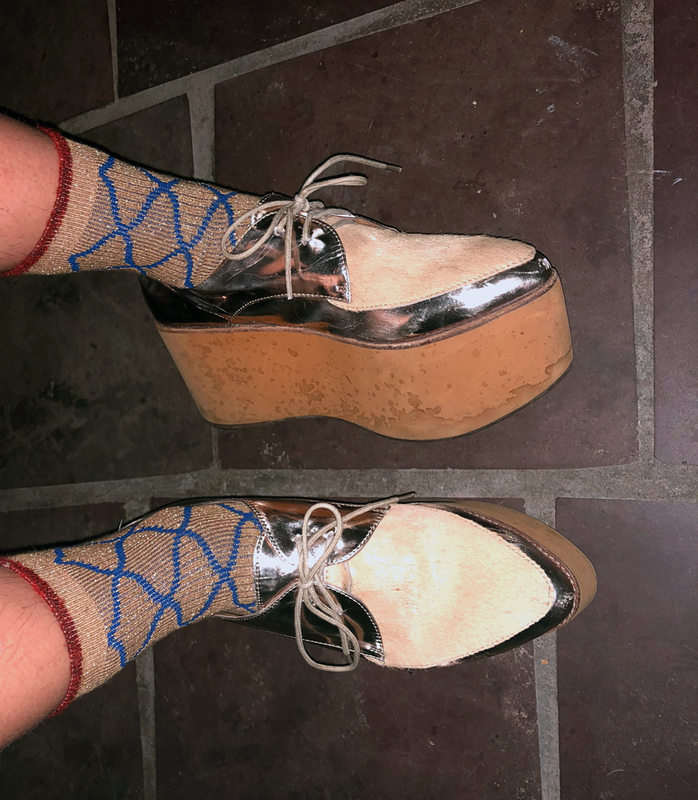 I had a really interesting and kind of different sense of style and I got these shoes because they kind of brought together all of the different elements from fashion that I appreciated; at a time where my stylistic choices were changing a bit. Back then, I tended to move towards fashion over form or function like, "if it looks good - get it, wear it" kind of thing. I had been in the habit of buying five to six inch stilettos and had quite the collection of incredible heels — some of which never saw the light of day — they were just showpieces in my closet. Which shows how much I was shopping and how little it was actually appreciating the things that I bought. But these … These were gold platform loafers and they have pony hair on the front. They were by my favorite shoemaker at the time, Jeffrey Campbell, because he makes really interesting and edgy pieces. I remember thinking "oh wow, these will satiate my desire to be taller than I am." Because at that time in my life I was also looking to somehow make up for, or substitute for, the fact that I didn't feel worthy or whole just as I was. I always wanted to be 10 pounds thinner and four inches taller. So I thought, "Yes, this will satisfy my desire to be taller." They're the only pair of shoes that has survived from that time ... the only pair of shoes that has seemed to be forever with me; and that have been able to withstand the evolution of my style. So now I definitely would say that I'm in like a period of 'boho-chic meets like 70's psychedelia' and these loafers are perfect and they're just on the borderline of what I would consider comfortable these days — where before it was like a revelation, five to eight years ago or something. I've since fully recovered from bulimia and substance addiction and now live a super healthy, very happy life. And the shoes are almost a reclamation of myself from before the addictions. Because they are fun, and funky, and creative, and a bit unusual, and super original. I feel like, since healing from my addictions, I've definitely reclaimed the most authentic parts of myself and I think these shoes will be with me for a while because they continue to show up as an expression that very self. Though, realistically, I'd rather go barefoot these days.